Your here! Great! Welcome! You presumably wish to develop better skills at discerning rhythm. Some rhythmic expression can be taught and understood using phonetics. Words have rhythm associated with them. Read this chart (Warning; you might get hungry!) and see the notation as it describes the syllabic inflection of the language. 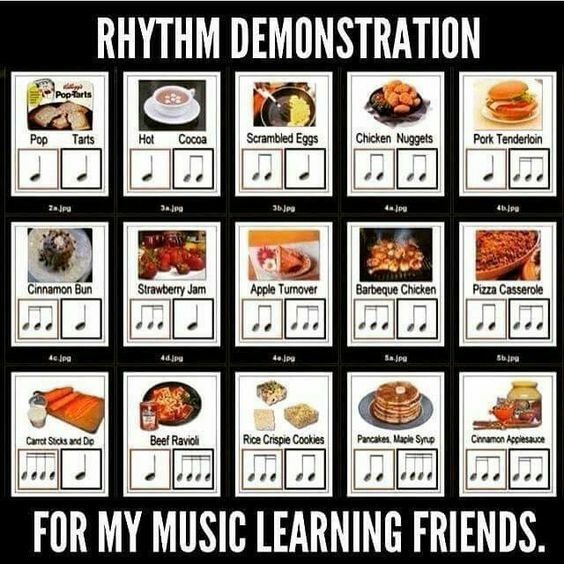 You can print this off the web, https://www.pinterest.com/pin/568579521684157037/ and use this basic reference chart to develop your ability to read and interpret rhythm. One Problem: There is not a single chart that can universally express all the combinations of rhythmic articulation associated with vocabulary. You need a more comprehensive system. The other challenge is not just executing the rhythm but how to bow it if you are a string player. Possible Action: This system is a good starting point, and if you read this carefully, you might gain additional insight for your skills. The best exercise is to develop a library of your own that works FOR YOU. Maybe use dog breed names like Col-lie, Bor-der Col-lie or Chi-hau-hua or I-rish-Set-ter, or types of beverages as a theme. Try it! And if you stumble upon Vod-ka or Mar-gar-i-ta in your chart, please don’t have any before rehearsal or before driving! This thwarts any progress to being a better sight reader, let alone being more effective in your private rehearsal, without a conductor present. The time the conductor spends singing your rhythm, is time they do not spend assembling the entire orchestral presentation. The more you do on your own, the faster and more developed an arrangement can be executed by the other 50 people in the room. These video links introduce you to simple and compound meter using Eastman. There are only 6 rules to master in the “Eastman” counting system. A note that begins halfway between two beats is called “te” (pronounced tay). A note that begins on the second quarter of the beat is called “ti” (pronounced tee). A note that begins on the second third of the beat is called “la” (pronounced lah). A note that begins on the third third of a beat is called “li” (pronounced lee). Counting Systems: “Eastman” versus “one-ee-and-uh.” This blog writer prefers “Eastman.” as does the credited Dr. Leinberger. The system is simple; there are only five [six] rules, and they allow for a wide range of rhythmic variety. The other system has a number of variables when dealing with triplets, and the use of “uh-one-uh-two” in counting swing rhythms can create confusion. One drawback of the “Eastman” system is a limitation within asymmetrical subdivisions. However, the other system doesn’t address asymmetrical subdivisions either. First: Take a sheet of music YOU KNOW and practice the phonetics of Eastman according to its rules. Find measures that have downbeats only, or simple down beat/upbeat combinations. Mark the downbeats with the number of the pulse (1, 2, 3 etc.). Mark any up beats with the “te” phonetic. 1 te 2 3 te 4 for example. Sing what you have written and check your work. Start with a melody or phrase you know to be able to self evaluation your application of the Eastman rules. Once you do this 4 step process a few times, you’ll get it. Now find additional passages. Try to sing them without writing the Eastman numbers or syllables above them. Be patient. Be diligent and repetitive at this task. Nothing you do well was perfect at the first attempt. Then: Take a music phrase you don’t know, and apply your Eastman knowledge to break down the rhythm BEFORE trying to play it. An Eastman Score document in PDF form is accessible on this link. Click Here. Print and keep this document in your music folder or binder as a reference, and make this part of the first two minutes of every wood shed rehearsal.